Summary: A cappella just got a makeover. Jordan Sun is embarking on her junior year at the Kensington-Blaine Boarding School for the Performing Arts, hopeful that this will be her time: the year she finally gets cast in the school musical. But when her low Alto 2 voice gets her shut out for the third straight year—threatening her future at Kensington-Blaine and jeopardizing her college applications—she’s forced to consider nontraditional options. Review: I am the opposite of musical, but I loved reading this book, which truly is a love letter to a cappella. And, I liked the queer and Asian representation within the book. But just to be clear, this is not a book about a non-binary or trans character. The language of the original book blurb on the cover seems to hint at this, but it isn’t the case – something that the author addresses in this post. I’ve grown up with a love-hate relationship with crossdressing manga series like Ouran High School Host Club and Hana Kimi. They were just so fun to read! But also pretty problematic, especially when it came to much older books. I was curious as to how Noteworthy would handle the subject. Gender and identity is discussed, and the heroine Jordan doesn’t shy away from grappling with the ethics behind what she does to keep her place in an all-male a cappella group. But again, if you’re looking for a non-binary or trans main character, this book is not it. I just bet this book is amazing for people who have anything to do with a cappella. Despite being not at all musical, I was hooked by all of it, and immediately looked up youtube playlists to listen to afterwards. 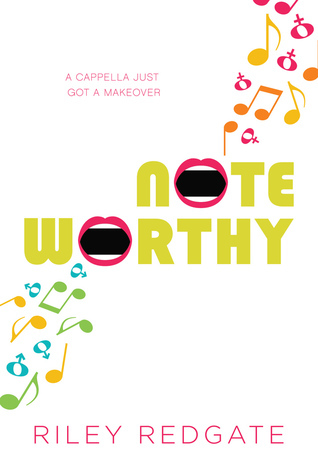 In Noteworthy, Jordan is plunged into an intense world of competitive a cappella and the social life that goes with it – all while, on the sidelines, her attention jumps to her parents on the West Coast struggling to get by. While my ship didn’t sail in Noteworthy (cry), what I truly fell in love with was the group dynamics, the strong thread of friendship that runs through the book. I would happily read an entire book made up entirely of the Sharpshooters’ group chat. One driving force for Jordan is her need to belong, and that’s a powerful theme throughout the book. Consider my heartstrings tugged. As with Seven Ways We Lie, I read Noteworthy in a few days and loved every moment of it. Days later, I feel like there’s still a lot about Noteworthy that I’d like to mull over. Whatever happens, I’m looking forward to the next book that Redgate writes! If you have any love at all for a cappella, definitely check this book out!